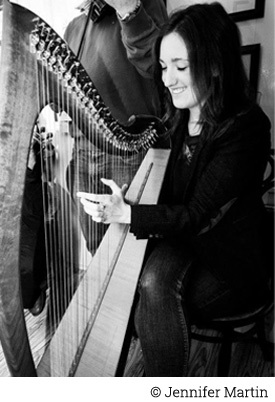 Cathy Potter is one of Ireland’s premier harpists and is very much in demand as a performer, teacher and session musician. 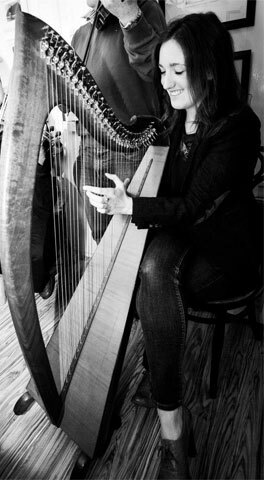 She has been playing the harp for 14 years and has 10 years performing experience. 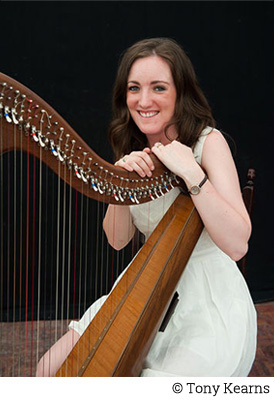 She has performed with the Chieftains and James Galway as part of the award winning Irish Harp Orchestra. She has also toured extensively in the UK, Ireland, Germany and America. Initially trained as a traditional Irish musician, Cathy has expanded her repertoire to include a mix of classical, folk, easy listening as well as popular classics and recent releases. Mainly I’m based with my lovely hubby in the beautiful County Clare so I am able to travel anywhere within one and a half hours from Ennis including Athlone, Galway, Limerick, Portlaoise and Tipperary. I’m originally from County Antrim, so I reserve a few dates to play for weddings around the North each year while I’m up visiting family and friends. I cater for all types of events including corporate, weddings, special occasions, religious services, family events and so on. I’ve had my Metallica grooms and my ‘Never Walk Alone’ grooms, and for the girls I’ve all the romantic soundtracks you’ll ever need from the Notebook to Breakfast at Tiffany’s. Of course as a traditional musician I can also jig and reel away to your hearts’ content. Please go to The Music section to hear some of my demos.